#1, Remember how we got here. Herbicide resistance in weeds is nothing new. The first reported instance of herbicide resistance in a weed species occurred in wild carrot in 1957 after several seasons of consecutive use of 2,4-D. In 1970, the first reported case of atrazine resistance was reported in common groundsel. Since those initial reports, the occurrence of herbicide-resistant weeds has risen each year. To date, there are 362 confirmed instances of weed resistance across 198 species, one-third of which occur in the United States. The point is, weed resistance is not a new phenomenon, we have dealt with triazine-resistant weeds, ALS-resistant weeds, and a host of other types of weed resistance for years. The only thing that is different now with respect to the glyphosate-resistant weed problem we are currently experiencing, is the extent of the acreage that is impacted and the degree to which we currently rely on one active ingredient—glyphosate—for weed control in our cropping systems. We have glyphosate-resistant horseweed (a.k.a. marestail) in a number of areas throughout the state, glyphosate-resistant giant ragweed that occurs sporadically throughout the state, glyphosate-resistant palmer amaranth that occurs as a significant problem in the boot heel of Missouri, and glyphosate-resistant waterhemp that now occurs as our biggest weed problem in almost all of the counties north of I-70 and some counties south of St. Louis and Kansas City as well. All of these resistant weeds have arisen as a result of our continual use of glyphosate for weed control in the same fields over time. We have selected for these resistant weed biotypes by applying glyphosate over and over, and now the only way to manage this problem is to apply herbicides with an alternate mode-of-action (more on this later). #2, Respect the biology of the weed(s) present. If we were to truly respect and understand the biology of the weed or weeds present, chances are we wouldn't have problems with herbicide-resistant weeds in the first place. This means recognizing the strengths of the weeds you're trying to control but more importantly recognizing their weaknesses. Once you understand a given weed's weakness, you must exploit it. For example, we know that waterhemp seed is relatively short-lived in the soil and that it does not germinate from lower soil depths. This means that if you were to really attack this weed for a three or four year time period and not let any plants produce seed that will go back into your soil, then you can virtually eliminate this weed as a problem from your fields. As for giant ragweed, it is one of the first summer annual weeds to germinate each spring, and a large percentage of the seedlings that are going to emerge will do so in that initial flush. We should take advantage of this biological characteristic by dealing with giant ragweed prior to planting with appropriate burndown herbicides or tillage. Horseweed is similar in this respect; it is a weed that will be present well before planting and we should take advantage of that fact. Whatever your problem weed is, think about the weaknesses of that plant and take advantage of those characteristics. #3, Rotating herbicide modes of action is the key. If you don't know what mode of action means, you will need to become familiar with that term in the future. The mode of action of a herbicide is the way in which a herbicide kills a plant. Some common modes of action you may have heard before include the PPO-inhibiting herbicides, ALS-inhibiting herbicides, ACCase-inhibiting herbicides, and others. In an effort to make this simpler, herbicide mode of actions are now being identified on herbicide labels with a number. For example, 2, 4-D is a group 4 herbicide, glyphosate is a group 9 herbicide, and so on. As already discussed, the way we select for any herbicide-resistant weed biotype is by applying a herbicide or herbicides with the same mode of action in the same place over time. As a result, the primary way to manage a herbicide-resistant weed biotype is to apply a different herbicide that has an alternate mode of action; hopefully one that has good activity on your resistant weed biotype. So if you have been applying a group 9 herbicide (glyphosate) and believe you now have resistant weeds, then it is imperative that you switch to a different family of herbicides that have a different group number other than 9, making sure that the herbicide you have chosen has good activity on the weed(s) in question. #4, Relying on post-emergence applications of PPO-inhibiting herbicides will likely lead to more failures in the future. With the herbicide options we currently have available in soybeans, post-emergence applications of glyphosate tank-mix partners are not the way to solve this problem. Period. For one thing, almost every one of our tank-mix partners is a PPO-inhibiting herbicide, and we have plenty of waterhemp populations with resistance to these herbicides as well. We now have many cases of multiple-resistant waterhemp around the state; waterhemp with resistance to glyphosate, to the ALS-inhibitors, and to the PPO-inhibitors. So in these cases, applying a PPO-inhibiting herbicide like Cobra, Flexstar, Cadet, Ultra Blazer or others for the control of your glyphosate-resistant waterhemp is futile, because those plants are also resistant to the PPO-inhibitors. Perhaps even a bigger problem than this is the amount of pressure that we are currently placing on our PPO-inhibiting herbicides. What do I mean by that? Just look at our history with this weed species; decades ago we used ALS-inhibiting herbicides until we got waterhemp with resistance to that mode of action throughout the state. We then started switching to the PPO-inhibitors to control the ALS-resistant waterhemp. We were starting to see PPO-resistant waterhemp when glyphosate and the Roundup Ready system were introduced onto the market. We then used that system for years for the control of our ALS- and PPO-resistant waterhemp. Now we have widespread problems with glyphosate-resistant waterhemp around the state. Many have attempted to "solve" this most recent problem by putting a PPO-inhibitor like Cobra, Flexstar, Cadet, Ultra Blazer, or others with their post-emergence glyphosate application for the control of their glyphosate-resistant waterhemp. See a pattern here? So we essentially keep moving from relying solely on one mode of action for the control of waterhemp to relying solely on another mode of action, usually to the point that we break each one. I believe that if we continue to use the PPO-inhibitors as post-emergence products in this way, then we will be dealing with a bigger problem in the future—multiple-resistant waterhemp that we can't kill with any current post-emergence herbicide in a Roundup Ready soybean system. #5, Re-calibrate your mind as to what small weeds really means. This fifth "R" is a continuation of the previous one; if you are going to use PPO-inhibiting herbicides post-emergence for the control of glyphosate-resistant weeds like waterhemp (which I've already said is a bad idea), then we must spray plants that are NO MORE than 4-inches in size—preferably smaller. The same holds true with giant ragweed, horseweed, or just about any other weed that we are having trouble with lately. You must remember how sensitive these herbicides are to weed size. If you are going to take this route, the use of these tank-mixes must be planned; they cannot be applied as a rescue. #6, Residual herbicides will be the most important component of a resistant weed management program. At this point, I think the only viable option we have moving forward, especially for the control of resistant waterhemp, is the use of pre-emergence, residual herbicides. Fortunately for us, the majority of our pre-emergence herbicides available for use in soybeans have good activity on waterhemp. However, I want to point out that in most cases you don't have to use the pre-emergence herbicide rates that have been promoted in the past. In many cases, these are what have been referred to as "foundation" (or in many cases ½) rates. In other words, these were rates chosen years ago when we knew we could come back with a post-emergence application of glyphosate to clean everything up. The fact is, that's no longer a reality. So, it is my recommendation that you look closely at these labels and consider full use rates or even combinations of these products. You want to get as much residual activity as you can out of your pre-emergence herbicide application because as already discussed, we're running out of effective post-emergence herbicide options. 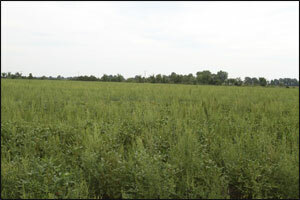 Soybean fields like this one infested with multiple-resistant waterhemp have become a much too common sight in Missouri. Following the 6 "R's" of herbicide-resistant weed management will prevent these problems from happening in the future. Another program to consider is an approach I refer to as "overlapping residuals". This may not have a fit for every weed species, but it does have a particular fit for waterhemp. In this type of program, you apply a pre-emergence herbicide at planting, in this case it may not need to be the fully labeled rate, and then early in the season when you come back with a timely post-emergence herbicide application, you apply a residual herbicide as well. Prefix and Warrant are two of the current products that allow this type of use pattern and at some point in 2012, two new products, Anthem and Zidua, are also expected to be labeled in this manner. Keep in mind that these herbicides are for the waterhemp that is going to emerge later in the season, not for what is there at the time of the application.